The Cuban New Yorker blog celebrates its first anniversary this week by returning to the topic of that first posting on June 11, 2012: the numbers. In “How Many Cuban New Yorkers?” I presented the results of the 2010 U.S. Census of Population on the Cuban-origin population residing in Greater New York. Those results showed that there were 40,840 persons who identified themselves as being of Cuban “origin or descent” in the five boroughs. Manhattan had the most of the five, with 11,623. [I did noted, of course, that New Jersey-across-the-Hudson does dwarf New York City in terms of numbers of Cubans]. So this post focuses on Manhattan and asks the question: Where do Cuban Manhattanites live? In subsequent blogs I will ask the same question about Cubans in the other boroughs and I may even do New Jersey. To answer the question I will use the figures on the population of “Cuban origin or descent” (self-identified) that the 2010 U.S. Census found in each of the approximately 500 census tracts in Manhattan. A census tract is a geographic division used by the Census Bureau to present data for relatively small areas within cities. Census tracts usually have about 4,000 persons. But in areas of cities with high population density, census tracts can be quite large in terms of population and small in terms of land area. A typical census tract in Midtown West or in the Upper East Side, as an example, is four uptown/downtown blocks by two crosstown blocks. But census tracts can vary widely in the shape of their boundaries, land area, and population. Looking at the distribution of Cubans across all the census tracts in Manhattan, it is evident that there are no overwhelming concentrations of Cubans on the island, that is, there are no census tracts in which Cubans represent a significant proportion of the total population of the tract. While there were nearly 12,000 Cubans living in 2010 in Manhattan, no one census tract had more than 300 Cubans. Nevertheless, there are areas of Manhattan that have more Cubans than others. In this map I have filled in red the census tracts with more than 100 Cubans. It is clear that Cuban Manhattanites are westerners and northerners, especially the latter. The southernmost census tracts are in Midtown West, around John Jay College, west of the Time-Warner Center. But those have less than 150 Cubans each. The more numerous ones are in the Upper West Side, West Harlem, and, especially, Washington Heights. The census tract with the most Cubans is tract 265, which in 2010 had 253 Cubans. 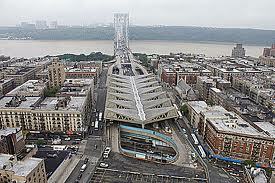 That is the tract that surrounds the approach to the George Washington Bridge and the bus terminal (177 to 181 Streets and between Riverside Drive and Broadway). Other tracts with sizable numbers are along Broadway, from 158th Street all the way north to Inwood. My sense is that this pattern of settlement in the northwestern quadrant of Manhattan is a long-standing one, dating back to at least the post-World War II period, when there was a significant Cuban migration to New York. That is actually a researchable assertion, but would involve a rather tedious process of digging up data from the pre-digital era and adjusting for changes between censuses in the tract boundaries. It’s on my to-do list. What may have shifted over the past decades is the distribution of Cubans between the Upper West Side and Washington Heights. My sense (again, an assertion, a hypothesis) is that the Upper West Side was the primary area of settlement for Cubans up until the area’s gentrification, back when it was primarily Puerto Rican, east of Broadway, along Columbus and Amsterdam. The Latino population in the Upper West Side has declined precipitously since the 1980s and that’s probably when the shift towards the north intensified, about the time the Dominicans started coming in and settling in the Heights. I would argue further that the relative absence of Cubans on the eastern side of Manhattan is also historical. Cubans joined Puerto Ricans in the Upper West Side, but not in sizable numbers in East Harlem or in the Lower East Side. It is in the west and north of the island where the Cubans’ Manhattan imaginary resides. It was there that Oscar Hijuelos placed the Santinio family in Our House in the Last World (1983) and where the Castillo brothers also made their home in his The Mambo Kings Play Songs of Love (1989). It was in Washington Heights where El Súper battled snow, garbage, the boiler, nostalgia, and displacement in the 1978 film by León Ichaso and Orlando Jiménez Leal. 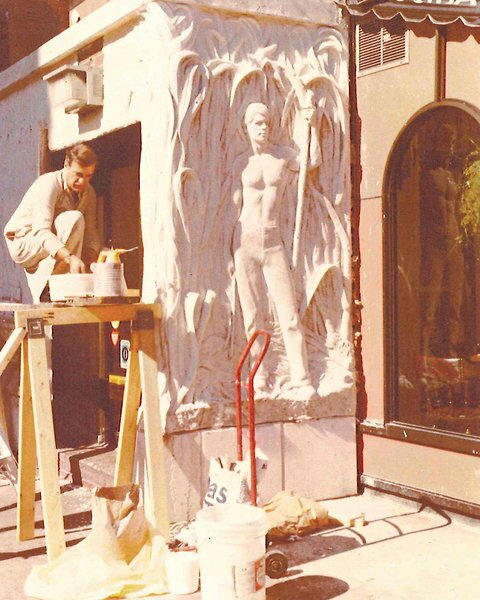 The restaurateur Victor del Corral left his mark on the corner of Columbus and 71st Street by commissioning a high relief mural of a Cuban sugar cane field for the façade of his restaurant, which during the 1960s and 1970s served the locals the dishes of their homeland. 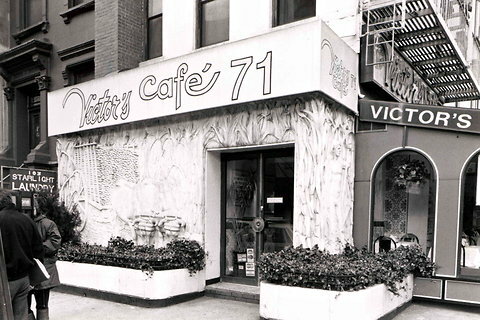 Decades after Victor’s Café moved to the Times Square area, the cane field, the oxcart and the young cane cutter depicted on the mural are still there, even as the neighborhood has been completely transformed. The space is now occupied by a bistro that bills itself as “the sexiest addition to the Upper West Side since Lauren Bacall moved into the Dakota.” The owners initially wanted to get rid of the mural, but were persuaded by preservationists to keep it. 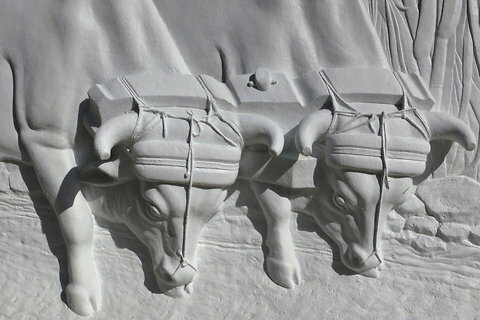 The yoked oxen that pull the cart, “two decrepit, sappy cows” as the new owners labeled them initially, are the plaster guardians of a bygone era: in 2010, the Census Bureau found only 66 Cubans living in census tract 157, where the oxen still stand on a Cuban sugar cane field.